These are just a few of the faces of candidates in 2018. They’re female, they’re almost all Democrats, they’re not all white, and many of them won. Each December, Time magazine announces its Person of the Year. It’s the individual (or group) who, “for better or for worse,” as the magazine puts it, had the greatest influence on the events of the year. This year, it should be no contest. The greatest influence in America this year came from Democratic women. They were the millions of women who marched, who ran for office, who voted, and who demanded that their voices be heard. And we all saw the results in the midterm elections. Displaying his typical (yet undeserved) over-the-top egotism, Donald Trump announced that “I can’t imagine” anyone other than himself as Time’s Person of the Year. Time usually picks the winner of a presidential election as Person of the Year, so he got the call in 2016, as did Barack Obama, George W. Bush, Bill Clinton, and other presidents before him. Too bad the public disagrees. In Time’s readers’ poll (no doubt social media-driven) on who should get the honor, Trump got only 2 percent of the vote. He was beaten out by 23 other candidates, including Robert Mueller (that’s gotta sting), Christine Blasey Ford, Michelle Obama (hey, her book Becoming outsold any of Trump’s books—bigly), Colin Kaepernick, and Jeff Bezos (owner of the “failing” Washington Post). Also getting 2 percent of support were Maxine Waters and Stormy Daniels—like that company, Trump? At least he got more votes than Melania. The top vote getter was the South Korean boy band BTS, so that’s how seriously we should take this survey. This year, Democratic women made the difference. 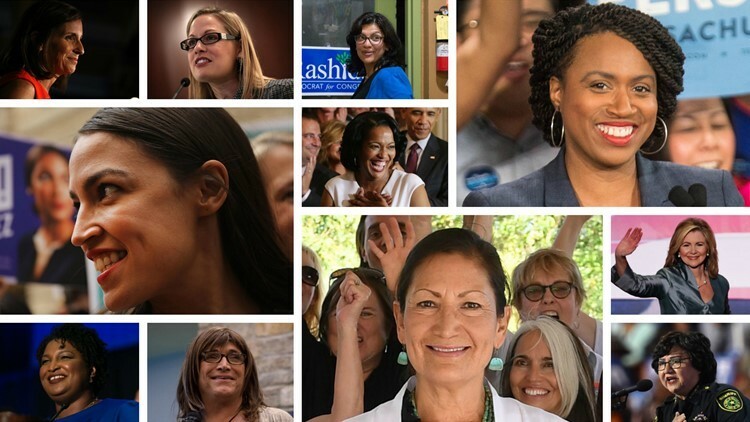 It’s not just one woman but a female Democratic collective: the candidates, the voters, the canvassers, the phonebankers, the marchers, the resisters, the legislators. The candidates: We’ve all seen and read the numbers: Emily’s List got inquiries from more than 42,000 women wanting to run for office in 2018, up from 920 in 2016. Out of that total, upwards of 5,000 received candidate training, and 500 were endorsed by Emily’s List. [M]any of the members of the freshman class [are] blazing a trail for other candidates of color. Several of the freshmen-elect are the first African-American women to be elected by their states, and voters in Kansas and New Mexico will send the first-ever Native American women to the House. With Nancy Pelosi (who raised boatloads of money for Democratic candidates to help them win) headed to another term as House speaker; Democratic women making more media appearances and becoming more influential on social media; and some Democratic women possibly gearing up for a 2020 presidential run, it’s clear that women legislators will have growing influence in coming months. Across the aisle, on the GOP side? Not so much—there were only four newly elected Republican women. The voters: Traditionally, more women than men turn out to vote, and that likely held true in 2018, although numbers are still being crunched. What is clear is that women boosted overall voter turnout to 49 percent in the 2018 midterms. Midterm turnout usually averages about 40 percent. The gender gap showed that 60 percent of women voted for Democrats, while only 47 percent of men voted blue. So all those new Democratic officeholders have women voters to thank: “Democrats won women’s vote for Congress by the largest margin seen in midterm exit polls” was a post-election headline in The Washington Post. White women without college degrees moved modestly toward the Democrats, more so than white men without college degrees. But a far greater proportion of white college-educated women swung to the Democrats, even beyond their previous support for Democratic candidates in previous elections. Key to the Democratic successes were the most reliable Democratic voters of all: black women. According to figures from Pew Research, 92 percent of black women voted Democratic, and they turned out in huge numbers, just like they always do. But they weren’t quiet about their role—they wanted to make sure candidates sought their input and spoke to them directly. [Abrams] has been firm and consistent in her message from the jump, detailing plans to address health care and education, issues that she knows are important to Black women. Latinx women voters also played a big part: According to data from Pew, 73 percent of Latinas voted Democratic in congressional races. The marchers, the resisters, and the organizers: Millions of people—not only women, but a big majority of them were female—turned out in January 2017 to register their feelings about Trump’s presidency in a Women’s March that exceeded all expectations in marches across the country. The second march in January 2018 also attracted millions, with a focus on running for office and voting. All of that energy turned into the Resistance, but that’s only one part of it. After the Valentine’s Day mass shooting at Marjory Stoneman Douglas High School in Parkland, Florida, that killed 17, masses of people—again, the majority of them women—joined local chapters of Moms Demand Action for Gun Sense in America. Now, along with the affiliated Everytown for Gun Safety, it’s 5 million members strong. The organization backed candidates in state and federal races across the nation, registering voters, knocking on doors, phonebanking, and performing other GOTV efforts. The gun reform groups proudly claimed after the election that their volunteers had helped to deliver a “gun sense majority” to the House. No surprise: Nearly all of the people wearing those recognizable red T-shirts are women. And just in case you were wondering, there already are plans for a Women’s March on January 19, 2019, which is being dubbed the #WomensWave. It makes sense: The Blue Wave wouldn’t have been possible without a Women’s Wave. All of the energy from Democratic women was the driving force in taking back the House and in electoral wins across the country at all levels. And whether or not the editors at Time take my advice in naming the Democratic woman as the Person of the Year, I can’t wait to see what Democratic women accomplish in 2019 and beyond. Originally posted on Daily Kos on Dec. 2, 2018.